One key to achieving a sustainable society and tackling the complex environmental challenges of the twenty-first century is pollution prevention (P2), reducing or eliminating pollution before it is created. The idea has been discussed since 1976, but has only lately gained widespread support from both the private and public sectors. It is an environmentally sound and cost-effective practice. Reduces the hazards to public health and the environment associated with the release of such substances, pollutants or contaminants. The term includes equipment or technology modifications, process or procedure modifications, reformulation or redesign of products, substitution of raw materials, and improvements in housekeeping, maintenance, training or inventory control. Since the Industrial Revolution, U.S. environmental policy has focused on end-of-pipe environmental remediation, control, and disposal. The endof-pipe approach involves combatting pollution, regardless of what form (solid or hazardous waste, air emissions, or water discharge), only after it has been created. To control end-of-pipe pollution, society issues permits. These permits set threshold limits for how much pollution a facility is allowed to create, taking into consideration the ecosystem in which the company operates. The more fragile the environment, the more consideration, presumably, is given to the allowable level of pollutant discharge. The result is that a company may obtain a permit to emit a certain amount of carcinogenic chemicals into the air or water as a by-product of its operations. The same system also holds true for communities. A community, for instance, acquires a permit to operate a landfill. The permit will stipulate certain types of waste for disposal, as well as place limits on the quantity that may be dumped on a daily basis. *As of 2002, the information listed above is being compiled into a comprehensive study and evaluation of P2 efforts over the past decade. The data listed here were reported by individual state agencies and are only intended to present baseline data, by which future P2 efforts can be measured. These numbers were the result of a survey conducted by NPPR from 1990 through 2000. Some programs submitted surveys, others reports. In no way should these numbers be used to compare programs. Unless otherwise noted, results date from the period when the state commenced its P2 program. Some states have had assistance programs much longer than others, and some may have smaller operating budgets for their programs. Maine 220 toxic-use companies reduced 105 million lb. toxic chemicals/5.6 million lb of waste reduced at 167 hazardous waste generators—63 toxic-release companies have reduced releases by 12.7 million lb. Hazardous waste reduction overall has generated $50 million in cost savings to Maine businesses. Massachusetts Reduction in toxic chemical waste generation by 60 million lb or 57%, reduction in total chemical use by 317 million lb or 41%, reduction in toxic releases to the environment by 18 million lb or 87%. New Hampshire (7 years) P2 assistance provided to 43 companies resulted in cost savings of $2.8 million per year for a total of $19,600,000. Vermont Reduction in 38% in the total amount of hazardous waste generated through the end of 1998. Rhode Island RI DEM performed more than 250 site assessments that resulted in elimination of more than $40 million tons of industrial waste. North Carolina Since 1993 air pollutants reduced by 122,000 lb, water pollutants reduced by 11,836,500 lb, waste reduced by approx. 64 million lb. In 1999 energy conserved: 344,000 kW; water conserved: approx. 77,296,000 gallons. $55,318,400 estimated total cost savings from P2 efforts. Iowa Iowa Waste Reduction Center at the Univ. of Northern Iowa has conducted more than 2,100 on-site reviews at Iowa small businesses since its inception in 1988. Approx. 87 million lb of hazardous and solid waste have been reduced as a result. Alaska Since 1994 the Alaska Dept. of Environmental Conservation's Compliance Assistance Office has helped businesses reduce waste by 201,500 lb. Cost savings are estimated at $1,752,000. 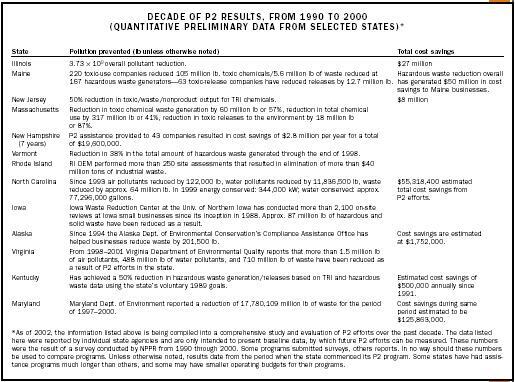 Virginia From 1998–2001 Virginia Department of Environmental Quality reports that more than 1.5 million lb of air pollutants, 488 million lb of water pollutants, and 710 million lb of waste have been reduced as a result of P2 efforts in the state. Kentucky Has achieved a 50% reduction in hazardous waste generation/releases based on TRI and hazardous waste data using the state's voluntary 1989 goals. Estimated cost savings of $500,000 annually since 1991. Maryland Maryland Dept. of Environment reported a reduction of 17,780,109 million lb of waste for the period of 1997–2000. Cost savings during same period estimated to be $125,863,000. Even recycling efforts, important as they are, focus attention on the back end of the pollution process, after waste has been produced. Recycling is an end-of-pipe solution. Another outdated aspect of U.S. environmental policy is the single-medium approach to environmental problems. Single-medium approaches focus on one specific environmental medium (i.e., land, water, or air) at a time, generally to the exclusion of other media. Air pollution experts, for example, do not typically investigate other facets of a facility, such as its overall operation, waste generation, or water discharges. They view their one medium in isolation and may recommend new procedures or remedies that can adversely impact other media. It is not uncommon to see an inspector recommend measures to improve air quality that affect water quality or waste generation—thus simply transferring pollution from one medium to another. The United States takes the single-medium approach because major environmental statutes are single-medium in scope. The Clean Air Act, Clean Water Act, and Resource Conservation and Recovery Act (RCRA) each focus on individual media. They contain strong requirements that focus on end-of-pipe approaches to meet them. These statutes are at the core of U.S. environmental protection strategy. They have produced admirable results over the years, but are now facing the law of diminishing returns in the face of new complex environmental challenges such as global climate change, energy and water shortages, and persistent bioaccumulative toxics that pass easily from one medium to the next. Today's challenges demand the more innovative and vigorous approach of pollution prevention. There are many ways pollution can be prevented. Some of the simplest, the "low-hanging fruit" involve basic housekeeping and maintenance modifications that do not include major capital investments, but may produce significant dividends in terms of cost savings for compliance and operations. In an industrial setting, low-cost options can involve simply changing the filters on equipment more frequently, improving the maintenance of machinery, or replacing a solvent with a water-based alternative that performs just as well. In an office setting, it may involve requiring that all documents are printed on both sides of paper and that mugs are used instead of disposable cups. Less toxic alternatives, whether they be cleaners or office paper produced without chlorine, are green choices . A farming operation can reduce its use of toxic pesticides or explore the economic feasibility of becoming an organic operation. Energy efficiency is a major component of pollution prevention and an increasingly important issue as we face shortages throughout the United States and global climate change. Again, low-hanging fruit opportunities abound. Options exist for more energy-efficient lighting and computer equipment. Simple business practices like turning equipment off at night can have a positive net environmental and cost outcome. Even choosing an office building or a plant location can have dramatic environmental implications. Is the facility located near mass transit? If it is, it gives employees the option of using public transportation and reduces the emissions of greenhouse gases from automobiles. Every state offers some type of pollution prevention assistance to aid companies and communities in identifying P2 opportunities. Because P2 is often not intuitive, government programs help provide a menu of available options to develop comprehensive programs. Many state agencies have engineers and planners on staff who have a wealth of expertise in working with a wide variety of industries. They provide training to company and community officials and disseminate technology, the sharing of information on technical issues and equipment. See the table for the results of P2 efforts in selected states over the past decade. The next phase of pollution prevention is to focus on more systemic changes. These may involve more capital investment and a major cultural change on the part of an organization—none of which can happen without the support of senior management. This is one reason why many companies are making sure that their innovative programs are integrated into their core business decisions. The lone environmental officer who focuses a company on complying with regulations still exists, but he or she is in many cases more actively involved in the daily business decisions being made by that company. This is crucial if serious process and operational changes are going to be adopted to help reduce pollution. Companies are investigating the use of pollution prevention equipment and comprehensive process changes that are less toxic and generate less waste. Utilizing equipment that is more efficient in its use of materials is a common pollution prevention practice. As stated, effective prevention will not occur without the backing of senior management, whether it be in the public or private sector. Many organizations create an official policy document, or expand their mission statement to incorporate innovative and cleaner production initiatives. Some organizations go as far as making a senior budget officer responsible for their company's P2 efforts. That way, there is a commitment from top management, particularly those who control the company's purse strings. TRI and other types of right-to-know programs publicly highlight chemical releases that industrial facilities release to the environment. These public disclosure programs force a company to evaluate its production process and the pollution it generates. The public component of the program helps put the spotlight on these firms, making it more likely that they will try to reduce future releases. Some environmentalists have also advocated reforming environmental report and permit programs so that reporting facilities essentially perform a pollution prevention audit—identifying waste streams and exploring opportunities to reduce them—in the process of complying with regulatory requirements. The public and private sectors play different, but equally important, roles in the effort to promote P2. Government regulatory drivers (statutes and regulations) provide incentives for companies to minimize pollution and thus avoid requirements in the first place. An example of an excellent regulatory measure is the use of P2 and a Supplemental Environmental Project (SEP). A SEP essentially means that an agency can require a company to implement a P2 program as part of their settlement. A state agency can also stipulate that a P2 program be part of an operating permit. There are a number of states conducting this kind of green permit program. State and local governments also offer critical technical assistance to companies and communities in identifying P2 options tailored to their needs. There are numerous tools available, including public information clearinghouses, on-site assessments, and a score of publications featuring case studies and guidebooks. Government can also offer market-based incentives, including low-interest loans for P2 equipment, reduction in reporting requirements, and public recognition programs that promote a company's environmental performance. The private sector plays the unique role of being the laboratory. Companies are able to experiment with different P2 practices and techniques within their facility. Given the proper flexibility and support, they can provide some of the major technical and cost data necessary for P2 to expand. Nongovernmental organizations such as community councils and environmental groups play an important advocacy role in the world of prevention. In the past, they have frequentlyprovided visionary leardership, helping, for instance, to shepherd the Pollution Prevention Act into reality in 1990. As stated earlier, the single-medium approach to environmental protection is an impediment to progress. Many attempts have been made to change laws or regulations on the federal, state, and local levels to leverage more opportunities for prevention and cleaner production without dismantling the current regulatory framework. The U.S. Environmental Protection Agency (EPA) has overseen several initiatives designed to allow more flexibility within the current system, in the hope of attaining more creativity and innovation. The Common Sense Initiative, 1994 to 1998, was an industry-based approach involving the automobile manufacturing, computers and electronics, iron and steel, metal finishing, petroleum refining, and printing industries. The program initiated more than forty-five projects, half of which, according to the EPA, are still ongoing. Similarly, the no-longer-funded Project XL allowed communities or businesses to test alternate ways of reducing environmental pollution. The National Environmental Performance Track is the current (2003) EPA program that encourages environmental solutions. This program recognizes and gives incentives to more than three hundred business members that go beyond regulatory environmental compliance and develop economically sound initiatives that further increase environmental protection. At the state level, environmental agencies can apply to the Performance Partnership Grants Program, authorized by Congress in 1996. It allows states to combine funds from up to sixteen environmental program grants into a single grant, for example, to address issues such as sprawl. In addition, state voluntary programs have proliferated and included recognition and environmental management system programs. The Pollution Prevention Act of 1990 provided a good foundation for pollution prevention in the United States. It established much-needed definitions, contained provisions to set up an information clearinghouse and awards programs, and most important, provided start-up funds for states and the EPA to work on dedicated P2 programs. Unfortunately, many provisions of the act were never fully implemented and appropriations were insufficient to orchestrate a comprehensive program. For example, less than one percent of federal grant monies to states for other media programs such as air, waste, and water goes to P2. Real change will come only by modifying key single-medium statutes. One idea, long proposed, is a unified organic statute. The existing statutes would be woven into a more holistic law, which is multimedia in scope, with prevention as the foundation. Others advocate the consolidation of only specific aspects of existing legislation. As of 2002, the National Pollution Prevention Roundtable (NPPR) is undertaking a major study to help quantify the results of pollution prevention efforts over the past ten years. Although the study is not complete, its raw data indicating significantly reduced or eliminated pollution and cost savings are impressive, considering the minimal resources that are available nationwide for prevention efforts. The table highlights some of the data provided by state programs. SEE ALSO A BATEMENT ; ; P OLLUTION S HIFTING ; R ECYCLING ; R EUSE ; T ECHNOLOGY, P OLLUTION P REVENTION ; W ASTE R EDUCTION . Hirschhhorn, Joel S.; and Oldenburg, Kirsten U. (1997). Prosperity without Pollution: The Prevention Strategy for Industry and Consumers. New York: John Wiley & Sons. Theodore, Louis; Dupont, Ryan; and Ganesan, Kumar. (1999). Pollution Prevention: The Waste Management Approach to the 21st Century. Boca Raton, FL: CRC Press. Marcus, Alfred A.; Sexton, Ken; and Geffen, Donald A. (2002). Reinventing Environmental Regulation: Lessons from Project XL. Washington, D.C.: Resources for the Future. Canadian Center for Pollution Prevention. Available from http://www.c2p2online.com . National Pollution Prevention Roundtable. Available from http://www.p2.org . U.S. Environmental Protection Agency. National Environmental Performance Track. Available from http://www.epa.gov/performancetrack . U.S. Environmental Protection Agency. Pollution Prevention Home Page. Available from http://www.epa.gov/p2 .